Chief Administrator: Kim Lu Lawe Ed.D. Gross Area: 105,500 sq. ft.
Area Per Student: 105.5 sq. ft. The eSTEM (Eastvale Science, Technology, Engineering and Mathematics) Academy is a specialized campus addition to Roosevelt High School in the Corona-Norco Unified School District (CNUSD). The eSTEM facilities are designed to accommodate growing student population needs while also providing innovative program spaces for the academy’s Health-Medical and Engineering-Design STEM pathways. The first priority of the community engagement process was for the integrated group of stakeholders and professionals to identify the core principles that characterize success for both the project and the design process: collaboration, access, partnership and flexibility. These values defined the design process for eSTEM and resulted in innovative learning spaces that promote student ownership, provide for flexible learning through multiple teaching modalities and allow for adaptable spaces that can evolve to accommodate future unknowns. 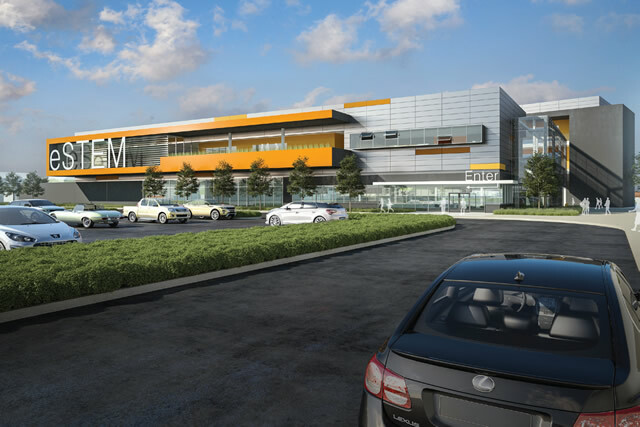 The vision for a STEM-based academy was guided by the district’s desire to build a state-of-the-art learning facility that addresses the strong community need in the medical and engineering professions by introducing students to these fields. 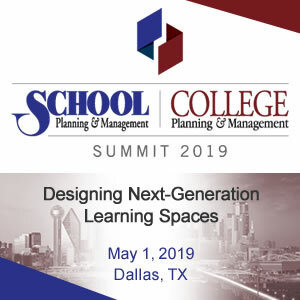 The district engaged local colleges and universities, and prominent professionals in the aforementioned fields early on to gain a better understanding of the skills a graduating student needs in order to succeed in both higher education and work placement. During the planning process, formalized relationships were made with local colleges and businesses to ensure that eSTEM students are able to earn college credits and engage in professional internships. The result of this effort was a team-authored, board-approved Educational Vision Document to serve as the foundation for the design process. The eSTEM Academy is simultaneously an addition to the Eleanor Roosevelt High School Campus (ERHS) and a separate STEM-based high school academy. eSTEM operates with its own administration, programs and campus amenities and intends to create a unique architectural identity that while still retaining a strong relationship with ERHS—a delicate balance. Building materials, scale and campus security are each carefully managed to create an identity for eSTEM that maintains a dialog with ERHS. The project’s program is divided between two buildings to create a central courtyard quad allowing the academy to operate as a “school within a school”, while a pedestrian boulevard connects this courtyard quad to ERHS. Site constraints create additional challenges for building this separate academy on an existing campus. The eSTEM Academy will stand where Eleanor Roosevelt High School’s practice softball field sits today. A condensed 3-acre site locked in between residences, playfields, and straddled by two fire roads, starts to establish very clear site parameters. In order to maximize outdoor learning space, to allow for the courtyard quad and to create a space buffer from houses, the program is consolidated into 2- and 3-story building footprints. The eSTEM Academy provides multiple types of flexible learning spaces that will allow students to work and learn in a variety of environment as they progress through their STEM pathway. Two lab typologies, design think labs and STEM labs, provide different experiences for students in their STEM coursework. Interconnected engineering and health-medical design think labs provide students with the opportunity to engage in project based learning by simulating real-world environments. Paired STEM labs provide space for students learn fundamentals, practice technical skills and engage in collaborative group work. These STEM labs are connected to, and integrated with, both learning studios (flexible 21st-century classrooms) and shared co-labs (student collaboration areas) to allow for interdisciplinary collaboration. Think or “spark” tanks can be found sprinkled throughout campus to offer opportunities to do the same on a smaller, more intimate scale. Outdoor labs take many forms, including floating learning pods, and can be found on each floor of this 3-story campus. The combination of numerous, dispersed, and varied learning spaces, coupled with visibility and access, encourages learning and collaboration to happen everywhere. One of the challenges of building this “school within a school” is finding the balance between creating a strong sense of identity for this specialized new campus and fostering an inclusive environment where eSTEM and ERHS students alike feel welcome. This quotient shapes everything from the program, to building and site design, to establishing site location. But as important as the connection between campuses, is the great sensitivity to respecting the privacy of immediately adjacent neighboring homes, complicating this balancing act. eSTEM aims to foster STEM education by allowing the building in and of itself to act as teaching tool. The idea that its architecture responds appropriately to sun, wind, and surrounding context; its building systems are exposed and celebrated; and its site clearly and elegantly demonstrates its response to storm water treatment is service that must be paid to the bright minds dedicated to learning in it. Operable windows encourage airflow through learning spaces to supplement the mechanical system. The campus collects stormwater from the building roofs and quad and treats it within infiltration planters strategically located around the site, cleansing the water prior to leaving the campus. These sustainable elements are illustrated through a series of wall graphics in the engineering and health-medical design think labs reinforcing the opportunities for students to learn about sustainability and providing students with another connection to the real-world professional applications of their technical education. As an addition to the ERHS campus, the building materials play an important role in defining the academy as a new facility while still relating to the existing campus. The second and third floors of eSTEM are clad in machined metal panels, imparting an enriched technical appearance to the buildings and displaying the STEM identity to the community. 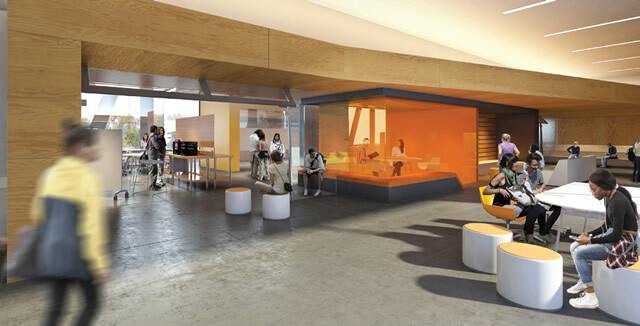 A solid plaster base at the first floor allows for durable entry and connection between the courtyard, student union, outdoor learning areas and the interconnected design think labs. 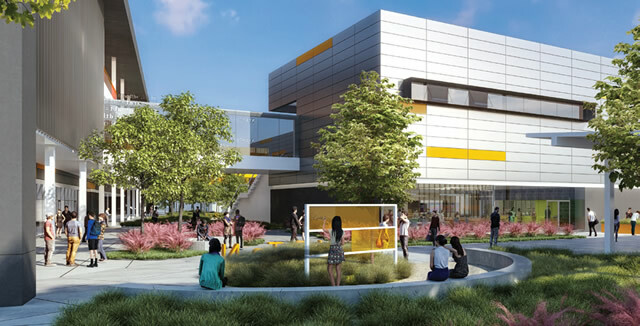 The metal panel “body” of the buildings open up on the courtyard side to reveal vibrantly colored plaster clad walls and an abundance of vision glass to showcase a racing pulse of student activity. Specialized graphics can be found throughout the project as wayfinding tools and teaching moments. One example of this is the glass guardrail at outdoor learning pods displaying working code language for students to decipher. In the earliest stages of schematic design, extensive site analysis was performed not only by the architectural and engineering design team, but by a wind consultant as well, due to the site’s high valley location. The north building wing rotates 10-degrees clockwise to protect the internal campus courtyard from harsh Santa Ana winds while screens on the west side of campus mitigate strong prevailing breezes. The building’s east-west orientation maximizes northern daylighting, while strategic screening elements minimize heat gain and glare from the south and visibility to the westerly houses. 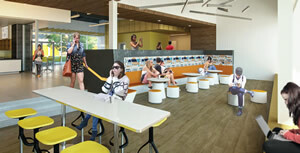 CNUSD set for the goal of creating a state-of-the-art facility, centered around the educational needs of the students. These project goals were met, while maintaining a focus on quality and meeting the project budget requirements. A collaborative process of review between CNUSD, Neff Construction and LPA established areas of priority, in regard to student use, flexibility and project design, and produced creative solutions to maintain the design intent while keeping the project within its financial constraints. The eSTEM Academy is being delivered to the Corona-Norco Unified School District through a Lease-Leaseback Contract. Neff Construction has been involved in the project from early on, providing pre-construction services such as consultation, constructability review, and input on project development and process to both the district and LPA. Inclusive planning, research, and partnerships. Nice resolution of tough site constraints. Nice indoor courtyard and variety of indoor learning spaces.